Hey! Where are you going? Robeez Friends Wrap Around baby shoes are made of a navy leather upper and feature a leather appliqué rhino split between the shoes. On the rhino's rear is his bird pal which is printed in red. This friendship continues on the shoes' soles where their likeness is embroidered. My 10-month is walking and he HATES shoes, he usually cries because he wants to take them off, BUT this soft soles are so comfy he doesn’t mind wearing them. It helps him walk sturdy too due to the strong sole. I’ve always heard good things about these shoes but I had to see it for myself. Happy with the purchase and the design too! This is our second pair of robeez. Great for new walkers and we love the cute patterns for pre-sneakers. They do show wear pretty quickly when worn outside. My son has been wearing Robeez since a friend introduced us! We’re very happy customers! Well made. Super soft. Stays put on my baby's feet with or without socks. 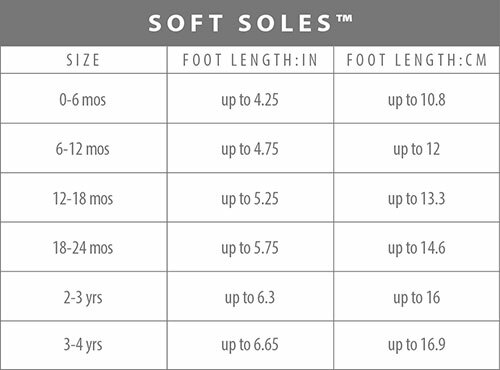 Used the measurements provided for the shoe to determine size and it was perfect. Would buy all the styles!